Abstract: Cardiovascular disease is the leading cause of morbidity and mortality among patients with diabetes mellitus, as well as the leading diabetes-associated health care cost. The prevalence and associated impact of cardiovascular disease among those with diabetes engenders the need to identify cardiovascular effects of antihyperglycemic agents. This review seeks to evaluate the impact of canagliflozin, a SGLT2 inhibitor, on cardiovascular risk factors and outcomes. The 14 published trials to-date exploring various cardiovascular risk factors and outcomes among patients receiving canagliflozin were identified and included within the review. Overall these studies demonstrate that among patients with type 2 diabetes mellitus, canagliflozin results in decreased systolic and diastolic blood pressure, lower body weight, and also exhibits reno-protective effects. These findings were similar when canagliflozin was compared to placebo or other antihyperglycemic agents and explored among subsets such as those with chronic kidney disease. In addition, findings from the three trials exploring cardiovascular outcomes of canagliflozin included reduction in cardiovascular mortality and lower incidence of heart failure-associated hospitalizations. Results from studies including other SGLT2 inhibitors suggest that cardiovascular benefits are likely a class-effect found among current SGLT2 inhibitors. Continued research specific to canagliflozin is needed to clarify risks of adverse effects and determine optimal dosing requirements for canagliflozin in regard to cardiovascular risk reduction. Cardiovascular disease (CVD) is the leading cause of morbidity and mortality among individuals with diabetes mellitus (DM) and comprises the largest component of direct and indirect health care costs associated with DM.1,2 The lifetime risk of the development of CVD among those with diabetes is heightened compared to the general population, ranging from 55% to 87% depending on gender and body mass index (BMI).3 The prevalence of CVD and its potential fatality among this population engender a need to identify strategies and therapies that potentiate and reduce adverse CVD outcomes among those with DM. SGLT2 inhibitors block the main site of glucose reabsorption within the nephron, leading to greater urinary glucose excretion (UGE).6,7 In patients without diabetes, glucose is filtered by renal glomeruli and reabsorbed in the proximal convoluted tubule. Six SGLTs actively assist in the reabsorption process, SGLT1 and SGLT2 being noted as the most important.8 SGLT1 is present mainly in the small intestine, as well as the heart, liver, lung, and kidneys, while SGLT2 is located largely in the kidneys.9,10 SGLT2 inhibitors prevent reabsorption of glucose in the proximal convoluted tubule, thereby facilitating glucose excretion in the urine. All SGLT2 inhibitors depend on blood glucose levels to exceed the decreased renal threshold for glucose to exert their mechanism of action, but there are pharmacologic differences between agents.8 For example, each medication in this class has a different affinity for SGLT1 and SGLT2, though they are all selective for SGLT2. Canagliflozin has a selectivity ratio of approximately 160–410 for SGLT2 over SGLT1, dapagliflozin a ratio of 1,200 and empagliflozin 2,600.11 Due to canagliflozin’s lesser SGLT2 to SGLT1 selectivity, it is known to have effects on not only renal glucose reabsorption, but intestinal glucose absorption and metabolism as well. In a crossover study evaluating canagliflozin’s effects on intestinal glucose absorption, canagliflozin reduced postprandial plasma glucose and insulin excursions by 35% and 43% (P<0.001 for both), as well as showing expected increases in UGE.12 Thus, canagliflozin is potentially classifiable as a local and low-potency SGLT1 inhibitor as well as an SGLT2 inhibitor. The pharmacologic effects of the unique SGLT2 inhibitor, canagliflozin, warrant further exploration to garner greater understanding of all therapeutic effects of this agent. Evidence is emerging describing the clinical effects of SGLT2 inhibitors, including canagliflozin on CVD and risk factors that contribute to development of CVD. This review seeks to explore the current evidence of cardiovascular risk reduction specifically for canagliflozin, the most widely prescribed oral SGLT2 inhibitor in the US.13 The current diabetes care guideline from the American Diabetes Association recommends the addition of canagliflozin to lifestyle management and metformin among those with T2DM and atherosclerotic CVD to reduce major adverse cardiovascular events (MACE).1 It is crucial for health care professionals to consider the body of evidence regarding the cardiovascular effects of canagliflozin in order to optimize the care of individuals with T2DM. This review has identified 14 published studies to date that have explored various cardiovascular risk factors among patients receiving canagliflozin. 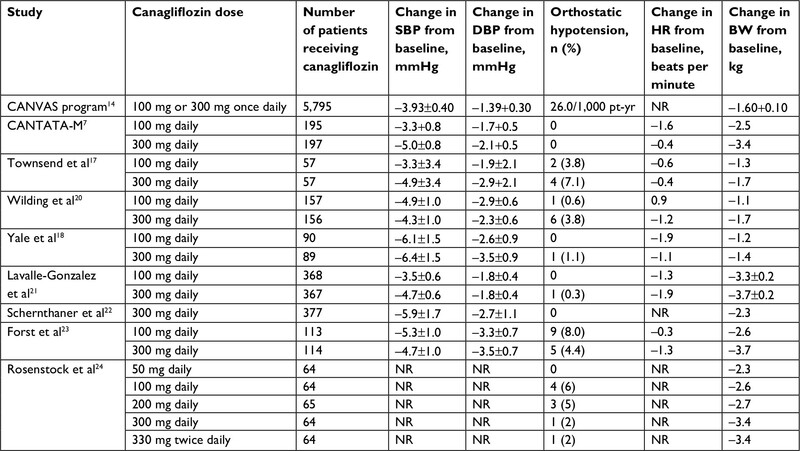 Table 1 provides an overview of design, population characteristics, and endpoints of the clinical trials outlined in this review of canagliflozin. These various trials of patients with T2DM studied the effects of canagliflozin in comparison to placebo or other AHAs, such as sitagliptin, glimepiride, DPP4 inhibitors (DPP4-Is), GLP-1 receptor-agonists, and insulin. Key study endpoints included changes from baseline in HbA1c and modifiable cardiovascular risk factors including BP, body weight, and renal function. 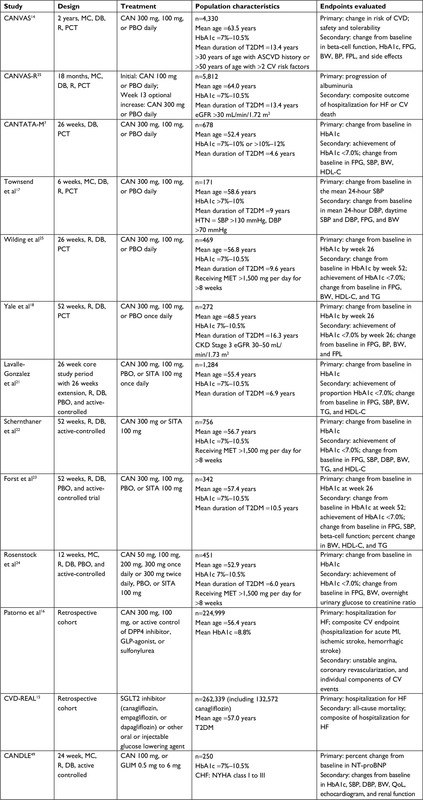 Further, several Phase 3 trials analyzed the effect of canagliflozin on the overall reduction of cardiovascular outcomes, including hospitalization for heart failure, acute myocardial infarction (MI), and nonfatal stroke.14–16 These various cardiovascular risk factors and outcomes explored among patients receiving canagliflozin are summarized in Table 2. Abbreviations: ASCVD, Atherosclerotic Cardiovascular Disease; BP, blood pressure; BW, body weight; CAN, canagliflozin; CHF, chronic heart failure; CKD, chronic kidney disease; CV, cardiovascular; DB, double blind; DBP, diastolic blood pressure; eGFR, estimated glomerular filtration rate; FPG, fasting plasma glucose; FPL, fasting plasma lipid; GLIM, glimepiride; HDL-C, high-density lipoprotein cholesterol; HF, heart failure; HTN, hypertension; MC, multi-center; MET, metformin; MI, myocardial infarction; NT-proBNP, N-terminal pro-brain natriuretic peptide; NYHA, New York Heart Association; PBO, placebo; PCT, placebo-controlled trial; QoL, quality of life; R, randomized; SBP, systolic blood pressure; SITA, sitagliptin; T2DM, type 2 diabetes mellitus; TG, triglyceride. Abbreviations: BW, body weight; DBP, diastolic blood pressure; HR, heart rate; NR, not reported; pt-yr, patient-years; SBP, systolic blood pressure. Other placebo-controlled trials of canagliflozin found similar BP effects. A trial evaluating BP effects at 6 weeks found significant decreases in BP among those subjects receiving canagliflozin.17 Similarly, a pooled analysis discussed the effects of canagliflozin on BP compared to placebo.19 The analysis supports the results of significant decrease in SBP with both canagliflozin 100 mg and 300 mg compared to placebo. However, the pooled analysis only found significant DBP reductions among subjects who received canagliflozin 300 mg, compared to 100 mg and placebo. In addition, the analysis revealed that the effect of canagliflozin on SBP and DBP resulted regardless of background antihypertensive therapeutics. When studies explored canagliflozin in addition to or in comparison with other AHAs, the canagliflozin cohort experienced similar BP lowering effects.20 When canagliflozin was evaluated as add-on therapy to metformin and a sulfonylurea, canagliflozin provided significant reductions in SBP and DBP compared to placebo.20 Several clinical trials compared canagliflozin to sitagliptin 100 mg, a DPP-4 inhibitor, to assess efficacy and safety. Canagliflozin 100 mg and 300 mg were associated with significant reductions in SBP and DBP compared to sitagliptin 100 mg across all three published trials.21–23 Additionally, minimal changes in pulse rate were observed between both doses of canagliflozin compared to sitagliptin. Obesity and sedentary lifestyle contribute to the progression of T2DM and increase the risk of CVD. Therefore, the first step in T2DM management is often weight loss, which is associated with lower insulin resistance, improved glycemic control, and decreased risk of comorbidity development.7 Canagliflozin 100 mg and 300 mg consistently resulted in significant reduction in body weight across all currently published trials. The CANVAS-R trial was the lead study assessing the effects of canagliflozin on renal function. This trial demonstrated canagliflozin’s reno-protective properties, through changes in albuminuria and eGFR.25 In this study, canagliflozin caused significant reduction in the risk of progression of albuminuria and more frequent regression of albuminuria compared to placebo. CANVAS-R participants were analyzed in subgroups based on eGFR set at ≥90, >90–60, >60–45, and <45 mL/min/1.73 m2.25 An initial decline in eGFR was observed in canagliflozin vs placebo at week 13 of treatment.25 The eGFR subgroups experienced placebo-subtracted least squares (LS) mean changes of −1.89, –2.33, –2.85, and –2.75, respectively.25 However, after week 13 canagliflozin was associated with an upward trend in eGFR toward baseline and significant slowing of annual decline in kidney function in T2DM patients (LS mean changes of 1.47, 1.09, 1.05, and 1.35 with respect to eGFR subgroups). Among patients with stage 3 CKD, those taking canagliflozin 100 mg and 300 mg had a lower amount of albuminuria progression vs placebo (5.1, 8.3, and 11.8%, respectively).18 In addition, the trial measured eGFR, BUN, and urine albumin/creatinine ratio to assess renal function in canagliflozin relative to placebo. Canagliflozin 100 mg and 300 mg resulted in an initial decrease in eGFR that was largest at week 3, then trended back toward baseline over the 26-week treatment period (LS mean percent changes –4.6 and –5.6%, respectively). Canagliflozin 100 mg and 300 mg were associated with an increased BUN vs placebo (LS mean changes 7.2% and 7.6%, respectively). There was a greater decrease in urine albumin/creatinine ratio seen with canagliflozin 100 mg and 300 mg compared to placebo (LS mean changes of –22.4% and –13.4%, respectively). Further research and ongoing studies, including the Canagliflozin and Renal Endpoints in Diabetes with Established Nephropathy Clinical Evaluation (CREDENCE) trial,28 will help to better characterize the clinical kidney outcomes of canagliflozin in patients with T2DM. Several studies on canagliflozin explored the agent’s safety and tolerability related to cardiovascular-specific endpoints and consistently found the agent to be well-tolerated with a modestly higher incidence of pre-specified adverse events (AEs) compared to placebo. Such pre-specified AEs included: urinary tract infections, genital mycotic infections, hypoglycemia, and events related to osmotic diuresis. Safety evaluations related to cardiovascular endpoints included the collection of intravascular volume depletion-related and osmotic diuresis-related events. The AEs associated with osmotic diuresis included pollakiuria (urine frequency) and polyuria (urine volume). The AEs that comprised intravascular volume depletion included postural dizziness and orthostatic hypotension. The class of SGLT2 inhibitors has sparked considerable interest as a potential therapeutic option for T2DM. In addition to providing a modest glycemic benefit, some SGLT2 inhibitors have also demonstrated efficacy in reduction of several cardiovascular risk factors such as BP and body weight. While many traditional therapies for T2DM result in weight gain or are weight neutral, the added benefit of weight loss with SGLT2 inhibitors is clinically important. Canagliflozin in particular, when compared with other SGLT2 inhibitors, resulted in the greatest reduction in body weight in one meta-analysis.39 Canagliflozin has also demonstrated consistent improvement in several individual cardiovascular risk factors such as BP, body weight, and renal function across multiple published studies. Many earlier studies evaluated these individual cardiovascular risk factors only as secondary or exploratory endpoints rather than primary areas of focus. These studies were not designed or powered to fully determine the clinical impact of canagliflozin on BP or the result of this impact on overall morbidity and mortality. Recent larger-scale studies have been designed to evaluate if properties like the antihypertensive benefits observed in canagliflozin and other SGLT2 inhibitors translate into clinically significant cardiovascular benefit, as the impact of these modifications on cardiovascular risk factors may not necessarily translate into reduction of overall cardiovascular risk. Empagliflozin was the first SGLT2 inhibitor to show improved cardiovascular outcomes, including reduction in death from cardiovascular causes via the EMPA-REG OUTCOME (Empagliflozin Cardiovascular Outcome Event Trial in Type 2 Diabetes Mellitus Patients-Removing Excess Glucose) study.40 While this study demonstrated benefit of empagliflozin in cardiovascular outcomes with high-risk patients, questions persisted regarding whether the overall cardiovascular benefits seen with empagliflozin were agent- or class specific. Composite results from the CANVAS program suggest a broader class effect in cardiovascular benefit with SGLT2 inhibitors. While the sample size of CANVAS was smaller and included a patient population with lower incidence of established CVD than that of EMPA-REG OUTCOME, a reduction in death from CV causes, nonfatal MI, and nonfatal stroke was still demonstrated. The recently completed DECLARE-TIMI 58 trial evaluating dapagliflozin compared with placebo in patients with T2DM and high CVD risk found dapagliflozin to be non-inferior for major cardiovascular AEs and demonstrated a statistically significant reduction in the composite endpoint that includes heart failure hospitalization or cardiovascular death.41 Future studies may provide further evidence to the class- vs agent-specific cardiovascular benefits of SGLT2 inhibitors. Other studies are also evaluating the role of SGLT2 inhibitors specifically in kidney disease, including CREDENCE (canagliflozin) and DAPA-CKD (dapagliflozin). It should be noted that while these cardiovascular and renal endpoint trials are informative, they are not designed to provide any direct comparisons among individual SGLT2 agents, and data should be considered in the context of the individual patient and the inherent variability of patient response to a particular drug. One notable difference in class effects between canagliflozin and other SGLT2 inhibitors has been in the safety profile. The canagliflozin group had an increased risk of amputation and fracture noted in the CANVAS trial that was not seen in EMPA-REG, with the highest absolute risk for amputation occurring in patients with peripheral vascular disease and prior amputation. The approximately two-fold increase in risk of amputation among patients receiving canagliflozin in CANVAS was unexpected, though there is not currently evidence to suggest a fully causal relationship between amputation risk and canagliflozin.42 However, in a pharmacovigilance analysis using the FDA’s Adverse Event Reporting System, Fandini et al reported that canagliflozin was found to have a higher incidence of any amputation among patients with DM (0.32%) compared to empagliflozin (0.09%) and dapagliflozin (0%).43 There are a few possible mechanisms whereby amputation risk could have been increased in the CANVAS program, though the true mechanism remains unknown. The overall amputation rate in patients with T2DM has declined over the last few decades, but diabetic foot disease (DFD) remains prevalent, increasing risk of lower-extremity amputation in itself.43,44 In the CANVAS program, a history of DFD and prior amputation were both risk factors for amputation.42 In a CANVAS sub-group analysis, there was a greater reduction of MACE in patients with a history of amputation than those without. This reduction in MACE occurred early in CANVAS, while amputation occurred more frequently in the late phase. This finding has led some researchers to postulate that perhaps a decrease in MACE could have been related to an increase in amputation risk. Despite these findings, a recent retrospective cohort study found no increased risk of lower extremity amputation for canagliflozin compared to other SGLT2 inhibitors and other AHAs.45 This finding could indicate the CANVAS program’s increased risk of amputation was related to other factors, such as non-adherence or other adverse effects. Compared to the empagliflozin group in the EMPA-REG OUTCOME trial, the canagliflozin group in the CANVAS program had an increased incidence of volume depletion-related AEs, which could have contributed to circulatory failure and perhaps increased the risk of amputation.42 Also, adherence to study drugs was lower in the CANVAS program (29%)14 compared with the EMPA-REG OUTCOME trial (25%).40 The lower adherence could have increased the incidence of amputation among canagliflozin patients, as discontinuation of the SGLT2 inhibitor could have led to further progression in peripheral arteriosclerosis.42 While a higher risk for amputation with canagliflozin may be inferred from this data, it should be noted that data on amputations were not specifically collected for EMPA-REG or other previous studies on other SGLT2 inhibitors. Therefore, further studies evaluating this risk as a class- or agent-specific effect should be conducted in order to determine the true clinical significance. In the meantime, clinicians should exercise caution in initiating canagliflozin in patients at risk of fractures or amputations. Lastly, further research should evaluate the potential dose-response relationship between canagliflozin and its cardiovascular benefits. While one earlier meta-analysis did not find a significant difference in BP lowering effects between the different SGLT2 inhibitors, the authors did note the presence of a significant association between increasing doses of canagliflozin and decreasing SBP.39 This dose response relationship may also correspond to overall cardiovascular benefits. Future studies are needed to discern if there is a target dose of canagliflozin that is necessary to achieve the full impact of cardiovascular risk reduction. Canagliflozin has consistently demonstrated, through published clinical trials, a reduction in cardiovascular risk factors such as BP, body weight, and renal function. These results suggest a class-benefit of SGLT2 inhibitors rather than agent-specific effects. Further research is needed to clarify risks of canagliflozin related to fractures and amputations, and determine optimal dosing requirements for canagliflozin in regard to cardiovascular risk reduction. American Diabetes Association. Standards of medical care in diabetes. Diabetes Care. 2018;41(Suppl 1):S1–S159. U.S. Department of Health and Human Services, Food and Drug Administration, Center for Drug Evaluation and Research. Guidance for industry: diabetes mellitus – evaluating cardiovascular risk in new antidiabetic therapies to treat type 2 diabetes. Available from: https://www.fda.gov/downloads/Drugs/Guidances/ucm071627.pdf. Accessed August 10, 2018. Fox CS, Pencina MJ, Wilson PW, Paynter NP, Vasan RS, D’Agostino RB. Lifetime risk of cardiovascular disease among individuals with and without diabetes stratified by obesity status in the Framingham heart study. Diabetes Care. 2008;31(8):1582–1584. Rydén L, Grant PJ, Anker SD. ESC Guidelines on diabetes, pre-diabetes, and cardiovascular diseases developed in collaboration with the EASD. Eur Heart J. 2013;34:3035–3087. Ulusoy S. Assessment of cardiovascular risk in hypertensive patients: a comparison of commonly used risk scoring programs. Kidney Int Suppl. 2013;3(4):340–342. Han Y, Cho YE, Ayon R, et al. SGLT inhibitors attenuate NO-dependent vascular relaxation in the pulmonary artery but not in the coronary artery. Am J Physiol Lung Cell Mol Physiol. 2015;309(9):L1027–L1036. Stenlöf K, Cefalu WT, Kim KA, et al. Efficacy and safety of canagliflozin monotherapy in subjects with type 2 diabetes mellitus inadequately controlled with diet and exercise. Diabetes Obes Metab. 2013;15(4):372–382. Poulsen SB, Fenton RA, Rieg T. Sodium-glucose cotransport. Curr Opin Nephrol Hypertens. 2015;24(5):463–469. Polidori D, Sha S, Mudaliar S, et al. Canagliflozin lowers postprandial glucose and insulin by delaying intestinal glucose absorption in addition to increasing urinary glucose excretion: results of a randomized, placebo-controlled study. Diabetes Care. 2013;36(8):2154–2161. Devineni D, Polidori D. Clinical pharmacokinetic, pharmacodynamic, and drug-drug interaction profile of canagliflozin, a sodium-glucose co-transporter 2 inhibitor. Clin Pharmacokinet. 2015;54(10):1027–1041. Stein P, Berg JK, Morrow L, et al. Canagliflozin, a sodium glucose co-transporter 2 inhibitor, reduces post-meal glucose excursion in patients with type 2 diabetes by a non-renal mechanism: results of a randomized trial. Metabolism. 2014;63(10):1296–1303. Agency for Healthcare Research and Quality. Total expenditures in millions by prescribed drug, United States, 1996-2015. Medical Expenditure Panel Survey. Agency for Healthcare Research and Quality; 2018. Available from: https://meps.ahrq.gov/mepstrends/hc_pmed/ Generated interactively. Accessed November 8, 2018. Neal B, Perkovic V, Mahaffey KW, et al. 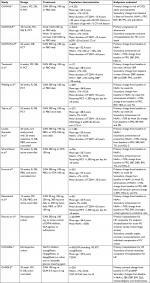 Canagliflozin and cardiovascular and renal events in type 2 diabetes. N Engl J Med Overseas Ed. 2017;377(7):644–657. Kosiborod M, Cavender MA, Fu AZ, et al. Lower risk of heart failure and death in patients initiated on sodium-glucose cotransporter-2 inhibitors versus other glucose-lowering drugs: the CVD-REAL study (comparative effectiveness of cardiovascular outcomes in new users of sodium-glucose cotransporter-2 inhibitors). Circulation. 2017;136(3):249–259. Patorno E, Goldfine AB, Schneeweiss S, et al. Cardiovascular outcomes associated with canagliflozin versus other non-gliflozin antidiabetic drugs: population based cohort study. BMJ. 2018;360:k119. Townsend RR, Machin I, Ren J, et al. Reductions in mean 24-hour ambulatory blood pressure after 6-week treatment with canagliflozin in patients with type 2 diabetes mellitus and hypertension. J Clin Hypertens. 2016;18(1):43–52. Yale JF, Bakris G, Cariou B, et al. Efficacy and safety of canagliflozin in subjects with type 2 diabetes and chronic kidney disease. Diabetes Obes Metab. 2013;15(5):463–473. Weir MR, Januszewicz A, Gilbert RE, et al. Effect of canagliflozin on blood pressure and adverse events related to osmotic diuresis and reduced intravascular volume in patients with type 2 diabetes mellitus. J Clin Hypertens. 2014;16(12):875–882. Wilding JP, Charpentier G, Hollander P, et al. Efficacy and safety of canagliflozin in patients with type 2 diabetes mellitus inadequately controlled with metformin and sulphonylurea: a randomised trial. Int J Clin Pract. 2013;67(12):1267–1282. Lavalle-González FJ, Januszewicz A, Davidson J, et al. Efficacy and safety of canagliflozin compared with placebo and sitagliptin in patients with type 2 diabetes on background metformin monotherapy: a randomised trial. Diabetologia. 2013;56(12):2582–2592. Schernthaner G, Gross JL, Rosenstock J, et al. Canagliflozin compared with sitagliptin for patients with type 2 diabetes who do not have adequate glycemic control with metformin plus sulfonylurea: a 52-week randomized trial. Diabetes Care. 2013;36(9):2508–2515. Forst T, Guthrie R, Goldenberg R, et al. Efficacy and safety of canagliflozin over 52 weeks in patients with type 2 diabetes on background metformin and pioglitazone. Diabetes Obes Metab. 2014;16(5):467–477. Rosenstock J, Aggarwal N, Polidori D, et al. Dose-ranging effects of canagliflozin, a sodium-glucose cotransporter 2 inhibitor, as add-on to metformin in subjects with type 2 diabetes. Diabetes Care. 2012;35(6):1232–1238. Neuen BL, Ohkuma T, Neal B, et al. Cardiovascular and renal outcomes with canagliflozin according to baseline kidney function. Circulation. 2018;138(15):1537–1550. Sano M, Takei M, Shiraishi Y, Suzuki Y. Increased hematocrit during sodium-glucose Cotransporter 2 inhibitor therapy indicates recovery of tubulointerstitial function in diabetic kidneys. J Clin Med Res. 2016;8(12):844–847. Invokana® (canagliflozin tablet, film coated) [package insert]. Titusville, NJ: Janssen Pharmaceuticals, Inc.; 2018. Jardine MJ, Mahaffey KW, Neal B, et al. The canagliflozin and renal endpoints in diabetes with established nephropathy clinical evaluation (CREDENCE) study rationale, design, and baseline characteristics. Am J Nephrol. 2017;46(6):462–472. Mahaffey K, Neal B, Perkovic V, et al. Canagliflozin for primary and secondary prevention of cardiovascular events: results from the CANVAS program (Canagliflozin Cardiovascular Assessment Study). Circulation. 2018;137(4):324–334. Cherney DZ, Perkins BA, Soleymanlou N, et al. The effect of empagliflozin on arterial stiffness and heart rate variability in subjects with uncomplicated type 1 diabetes mellitus. Cardiovasc Diabetol. 2014;13(1):28. Townsend R, Dharmalingam M, Genovese S, et al. Improvements in Blood Pressure (BP) and Markers of Arterial Stiffness with Canagliflozin (CANA) in the CANagliflozin CardioVascular Assessment Study (CANVAS) Program. Diabetes. 2018;67(Supplement 1):1210-P.
Pfeifer M, Townsend RR, Davies MJ, Vijapurkar U, Ren J. Effects of canagliflozin, a sodium glucose co-transporter 2 inhibitor, on blood pressure and markers of arterial stiffness in patients with type 2 diabetes mellitus: a post hoc analysis. Cardiovasc Diabetol. 2017;16(1):29. Ramirez AJ, Sanchez MJ, Sanchez RA. Diabetic patients with essential hypertension treated with amlodipine: blood pressure and arterial stiffness effects of canagliflozin or perindopril. J Hypertens. Epub 2018 Aug 14. Verma S, Garg A, Yan AT, et al. Effect of empagliflozin on left ventricular mass and diastolic function in individuals with diabetes: an important clue to the EMPA-REG OUTCOME Trial? Diabetes Care. 2016;39(12):e212–e213. Habibi J, Aroor AR, Sowers JR, et al. Sodium glucose transporter 2 (SGLT2) inhibition with empagliflozin improves cardiac diastolic function in a female rodent model of diabetes. Cardiovasc Diabetol. 2017;16(1):9. Matsutani D, Sakamoto M, Kayama Y, Takeda N, Horiuchi R, Utsunomiya K. Effect of canagliflozin on left ventricular diastolic function in patients with type 2 diabetes. Cardiovasc Diabetol. 2018;17(1):73. Januzzi JL, Butler J, Jarolim P, et al. Effects of canagliflozin on cardiovascular biomarkers in older adults with type 2 diabetes. J Am Coll Cardiol. 2017;70(6):704–712. Baker WL, Smyth LR, Riche DM, Bourret EM, Chamberlin KW, White WB. Effects of sodium-glucose co-transporter 2 inhibitors on blood pressure: a systematic review and meta-analysis. J Am Soc Hypertens. 2014;8(4):262–275. Zinman B, Wanner C, Lachin JM, et al. Empagliflozin, cardiovascular outcomes, and mortality in type 2 diabetes. N Engl J Med. 2015;373(22):2117–2128. AstraZeneca. Farxiga achieved a positive result in the Phase III DECLARE-TIMI 58 trial, a large cardiovascular outcomes trial in 17,000 patients with type-2 diabetes [press release]. AstraZeneca - Research-Based BioPharmaceutical Company; 2018. Available from: https://www.astrazeneca.com/media-centre/press-releases/2018/farxiga-achieved-a-positive-result-in-the-phase-iii-declare-timi-58-trial-a-large-cardiovascular-outcomes-trial-in-17000-patients-with-type-2-diabetes-24092018.html. Accessed October 20, 2018. Tanaka A, Node K. Increased amputation risk with canagliflozin treatment: behind the large cardiovascular benefit? Cardiovasc Diabetol. 2017;16(1):129. Fadini GP, Avogaro A. SGLT2 inhibitors and amputations in the US FDA Adverse Event Reporting System. Lancet Diabetes Endocrinol. 2017;5(9):680–681. Rinkel WD, Luiten J, van Dongen J, et al. In-hospital costs of diabetic foot disease treated by a multidisciplinary foot team. Diabetes Res Clin Pract. 2017;132:68–78. Yuan Z, Defalco FJ, Ryan PB, et al. Risk of lower extremity amputations in people with type 2 diabetes mellitus treated with sodium-glucose co-transporter-2 inhibitors in the USA: a retrospective cohort study. Diabetes Obes Metab. 2018;20(3):582–589. Gingerich CP. FDA Accepts Zynquista NDA for Type 1 Diabetes. MD Magazine. Available from: https://www.mdmag.com/medical-news/fda-accepts-zynquista-nda-for-type-1-diabetes. Published May 22, 2018. Accessed October 20, 2018. Garg SK, Henry RR, Banks P, et al. Effects of sotagliflozin added to insulin in patients with type 1 diabetes. N Engl J Med. 2017;377(24):2337–2348. Chen J, Fan F, Wang JY, et al. The efficacy and safety of SGLT2 inhibitors for adjunctive treatment of type 1 diabetes: a systematic review and meta-analysis. Sci Rep. 2017;7(1):44128. Tanaka A, Inoue T, Kitakaze M, et al. Rationale and design of a randomized trial to test the safety and non-inferiority of canagliflozin in patients with diabetes with chronic heart failure: the CANDLE trial. Cardiovasc Diabetol. 2016;15:57.